Every once in a while you meet a runner so inspirational that their story just has to be shared. In fact, Madelene Loots' story has so many inspirational angles that it's pretty hard to decide where to start sharing! Perhaps I should start with the fact that, less than a week ago, Madelene rocked the Two Oceans Half-Marathon at 33 weeks pregnant. 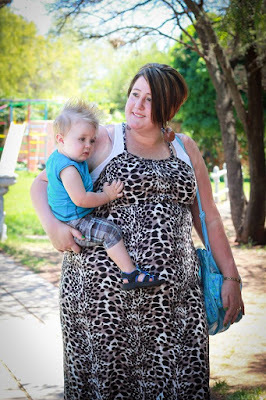 And even though that's a pretty amazing feat in itself, I just have to add one tiny little detail: She also has two toddler boys, aged three and one, at home. Jip - she consistently trained through all of that. Oh, and did I mention that she also works a full-time job as a teacher to learners with special needs? 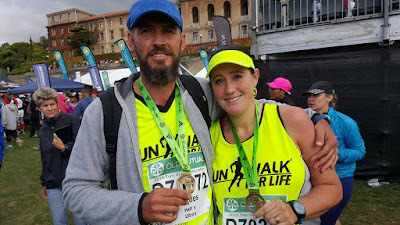 Madelene and her husband and biggest supporter, Jacques, after completing the Two Oceans Half last weekend. 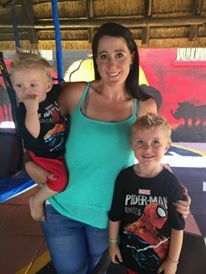 Madelene and her boys, Zirmandt (1 - left) and Zavian (3 - right). 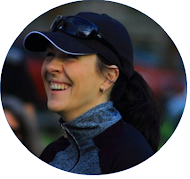 And if you're thinking that Madelene must be a seasoned runner with decades of running experience counting in her favour, you'd be wrong: She started her running journey a mere year ago. 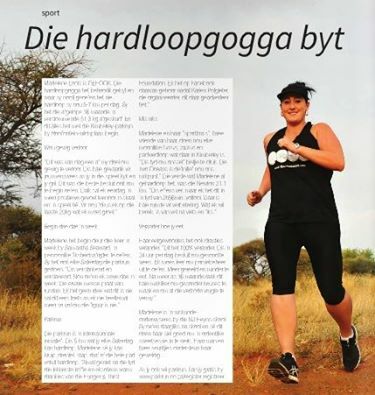 On 21 March 2015, Madelene toed the starting line of her local parkrun for the first time, weighing more than 50 kg more than she does now. Her journey of transformation had started a short while before that, under the watchful eye of her personal trainer, Samantha Seaward. Madelene and Zavian, prior to the start of her running journey. Madelene, who runs because it's "slimming and seriously addictive", admits that the initial comments of skepticism from naysayers who told her that running was bad for her joints, made her very negative. But, as time went on and the weight started coming off, running became easier and unsolicited opinions became a thing of the past. In addition to helping Madelene on this journey of reaching her goal weight, running has also helped her through some difficult times: In July 2015 she sadly had a miscarriage and found that lacing up her running shoes and going for a run was the best medicine for a broken heart. Running gave her an opportunity to cry through the sweat and the struggling without people asking any questions. These days Madelene trains six days a week, combining running and personal training sessions. She prefers to train at 04:00 a.m., while her kids are still asleep, which allows her to start each day on a positive note and without compromising on mommy-time. Madelene in action in an article recently published in the local Kimberley Glittermag. So what's her secret, you ask? I'm afraid you'll be disappointed if you're looking for a quick fix: "You are never mentally or physically ready [to start running]", says Madelene. "There is never a good time to run. It takes effort and a positive mindset. Even if you run for 20 m and then take a walk break, just run. Just get up and do it NOW. Any run is better than no run". And for the busy moms out there, Madelene has the following no-nonsense advice: "You will never have enough time unless you make time. Parenting, sick kids, a busy life and things to do are not good enough excuses". A woman to my own heart. 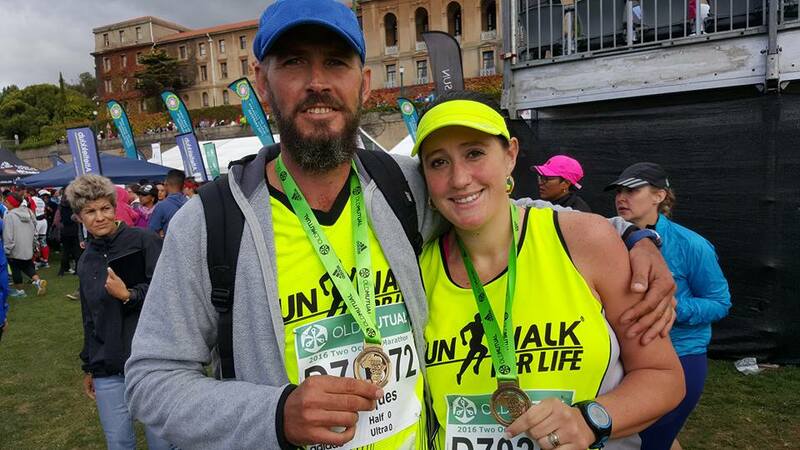 Madelene's future running goals include running 5 km in 25 minutes, a half-marathon in two hours, and no longer being seen as an overweight runner. And knowing Madelene, I know that it's only a matter of time. incredible story!! I am so inspired, and love her enthusiasm and determination - I just don't know how to get up at 4am to run!! Madelene's enthusiasm really is contagious, hey Meg? And I LOVE her no-nonsense, no excuses approach to running and exercise! My pleasure, Gordon - her story just had to be shared. She's one amazing woman! Wow this is beyond amazing and inspiring - well done on such an amazing success. I'll be sure to pass on your congratulations and good wishes to Madelene - thanks for stopping by!